Almost three dozen people from 15 countries took their first pledge of allegiance to become Americans at the Great Falls on Wednesday morning. Among the 35 people was Aliou Gassama, who came to the United States from Senegal 13 years ago. “What we feel today is we feel proud. We chose America. We want to follow the constitution and support the law,” said Gassama, a resident of Lodi, after receiving his naturalization certificate. Gassama, 61, said he came to the U.S. 13 years ago seeking opportunities. He has been working as a cashier at a gas station for eight years, he said. It took him five years to become a U.S. citizen, he said, as his wife listened to him being interviewed and son snapped pictures. Dyke came to the U.S. with his mother from Jamaica. He was 19, he said. He said he can now apply to bring his girlfriend from Jamaica to the U.S.
As a citizen of the mightiest republic on earth, Dyke expects better treatment from Jamaican authorities. “You get treated better,” said Dyke. “They respect you more.” He said an American passport almost always result in better treatment at his home country. The two men from Jamaica and Senegal were joined by others from the Dominican Republic, Colombia, Montenegro, Peru, Bangladesh, El Salvador, South Korea, Poland, Mexico, Israel, Albania, Philippines, and Costa Rica at the naturalization ceremony at Mary Ellen Kramer Park at the Great Falls National Historical Park. 12 of the 35 people were from the Dominican Republic. Colombia and Bangladesh, were tied in second place, each had 4 people become U.S. citizens. All of them had to renounce their loyalties to their birth countries for the U.S.
“It was here in this city, we declared our economic independence. It was here that many Americans began their pursuit of happiness, including my grandparents. Today, you begin your pursuit of happiness,” said Darren Boch, superintendent of the Great Falls National Historical Park, to the new Americans. Boch urged them to visit America’s natural treasures. He said said they are now co-owners of the country’s national parks. Boch said this is the parks 5th naturalization ceremony. It has become an annual event at the Great Falls. “It’s only fitting we’re here in Paterson because Alexander Hamilton is the founding father of this city,” said mayor Andre Sayegh. Hamilton was an immigrant from the Island of Nevis, he said. 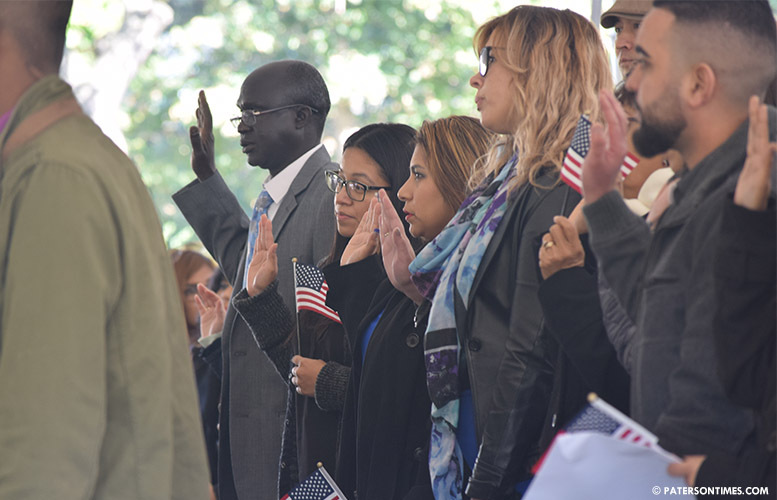 The new Americans watched a brief speech from president Donald Trump welcoming them as citizens and received a heavy dosage of patriotic songs and videos. Each new American received a gift bag containing a copy of the constitution, patriotic pencils, bookmarks, pinwheels, and other items from the Daughters of the American Revolution. Lynne and Gail Skead, sisters, distributed the gift bags to the 35 new citizens. “It’s all about patriotism,” said Lynne.